The EB Awareness Event started yesterday and was quite a success with a full sim and lots of people shopping. Epidermolysis Bullosa is a rare disease that affects 1 in 50,000 children born throughout the world as a result of a genetic disorder. It varies in severity among its sufferers. It is characterized by a defect between the anchoring of the skin between the epidermis (top layer of skin) and the dermis (second layer). People who suffer from EB suffer from skin fragility, blistering and constant pain. “Butterfly Children” is what kids with the disorder are called due to the fragility of their skin so a lot of the décor sold at the fair has butterflies on it. Kaerri Rae has made an entire set of furniture with monarch butterflies as the motif especially for this event with a large chunk of her income going to DEBRA of America. She offers two sets: one in white with dark gray accents and one in dark gray with white accents. Depending on your décor, you can choose a set and use the pieces with your own existing furniture. I set up two little nooks to show the set, and I included a few other pieces that will be sold at the EB Awareness event, including a darling lamp from Plato Novo. My sweater is also being sold at the event, a generous offer from Parallax Resident. The sweater comes with a texture-change HUD for some great sweater options. I have seen this in the men’s version too and it’s terrific. Portions of the sale of this sweater go to DEBRA of America. My jeans are a pair of great bell bottoms that Datrip Blackbart has at the Vintage & Cool fair in several colors. My shoes, which I adjusted to my Slink feet, are from Renee Harvy and can be worn without the feet. My handbag is one of the gacha items at Miffhoi Rosca’s kiosk at Season’s Story. Mochi Milena did an amazing job on the extensive skins she created for this month’s androgynous theme at Genre. I already knew that she put considerable effort into creating options for fembois and women who want cleavage and makeups. I really appreciate that Mochi offers these options to people who want to explore their identity. My hair is Mina Nakamura’s latest for the Dressing Room Fusion and so perfect for the season with a texture change hat as well as the mesh hair. Love this look! 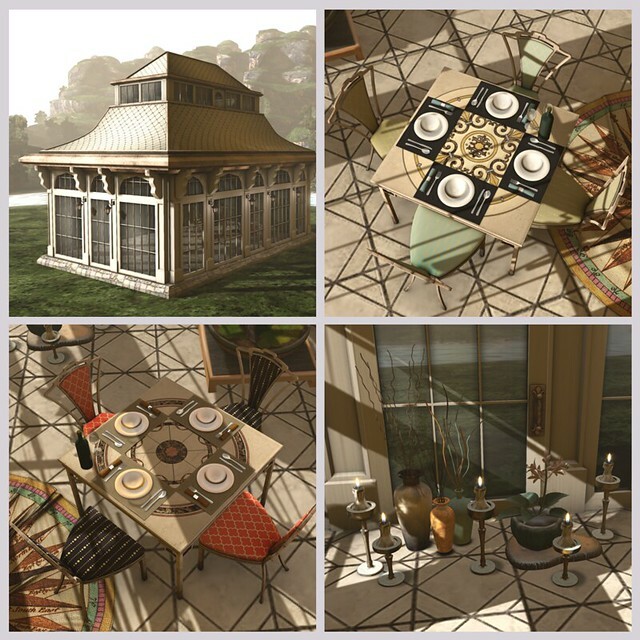 Kaerri Rae has given us a little summer breeze, in the form of a pavilion, a little inside for the outside or a little outside for the inside in the form of a limited edition set she has made for Casa. The pavilion itself comes with the fireplace (already set), the inset cushioned seat, the furniture, plants and décor. I intentionally set the whole scene without any other decoration so you can see exactly what comes with this. And it’s limited edition—only 15 will be sold at Casa, so make your way there now. I had a seat next to the talking parrot (seriously—he talks) to show you my great little plaid dress from Kinu Mayako that she is featuring at District 5. She actually has a tie-dyed version and a floral version too, but this one conveniently comes with a HUD so you can choose which plaid you like. My shoes are from Erratic Rain’s collection and the pink fit this look so well, I had to wear them. TOmmy Fairplay put out a group gift at District 5 for women and men, and this is the women’s. It’s a casual updo, messy enough for breezes on an open pavilion but still elegant. My skin is one of Shyla Diggs’ newer ones in her typical gorgeous style, and I discovered Mavi Beck’s nail applier gacha at District 5 when I was poking around and lost a lot of change! Tobias Convair believes in home and he knows his stuff. 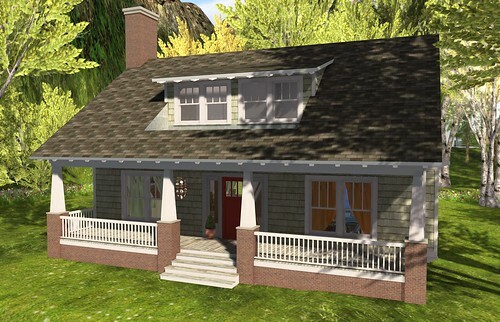 His latest release, the Pinewood Cottage, which he is selling at FaMESHed at a rock bottom price, is his American interpretation of home, an arts and crafts style bungalow which would find a safe place in many neighborhoods around the U.S. With a cozy floorplan that allows for small furniture groupings and an intimate upstairs space with room for a bedroom with fireplace, master bath and office, it’s a sort of archetype of the American dream and where else but SL would one best indulge that dream? I located the house on my parcel overlooking the Linden seas with a late afternoon light falling in the windows to match the shadows and sunlight Tobias baked in and furnished it with pieces I have collected and new furnishings out for sale right now. Start with the casual room to the side. 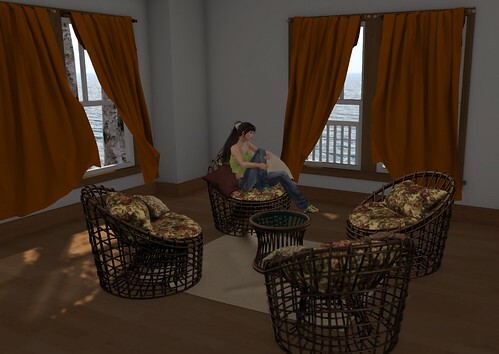 With flowing curtains from Isabeau Baragula that I used throughout the house, I put down Tya Fallingbridge’s darling rattan collection for FaMESHed, which would be great in a room like this or the kind of outdoor living room that is so popular here right now. With beautifully coordinated textiles, pillows and blankets, the set has a versatility with several sitting poses per chair. 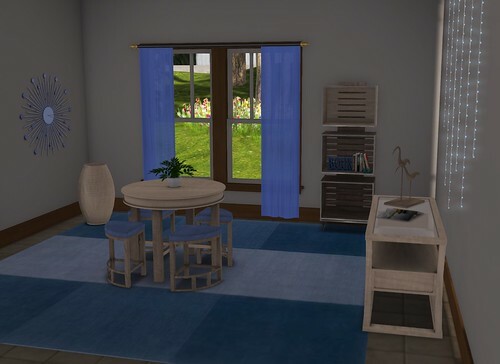 The casual dining room is furnished with Cherelle Capra’s blue and light wood furnishings that she sold at the Monochromatic Fair but which are now in her main store. Coordinated with several funky accessories (the retro clock and hanging lights), the set brightens up the house, giving a casual homey feel to the kitchen. 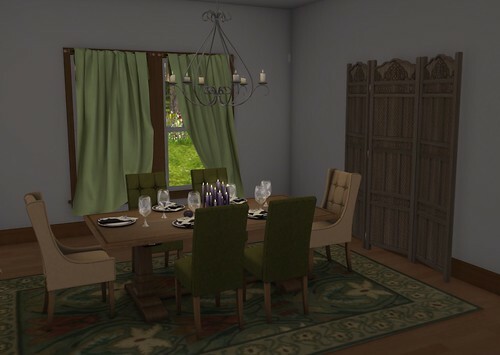 Cory Edo has made this formal dining room set for FaMESHed, which I have accessorized with Sway Dench’s gorgeous Moroccan carved screen and one of Tya Fallingbridge’s curved chandeliers. Cory provides the full compliment for a beautiful dining room including captains chairs with several texture change options, dining chairs, a gorgeously designed arts and crafts influenced table and separate dining pieces including place settings with color change scripts. A set of candles from Spooky Mistwallow’s RP store creates an elegant ambience to the scene. I found pieces with an East Asian influence from Kaerri Rae in my inventory to place in front of the cozy fireplace that Tobias has included with the house. Tobias’ fireplace set, sold separately at his store, fills the hearth with a warm glow while a floor cushion recently purchased from Wendy Xeno provides a space for singles or couples to cozy up by the fire. In my own home in SL there is no reason to dress up or flounce around in ball gowns. I chose separates from Paul Lapointe and Bastchild Lotus so I could color change to make a harmonious combination and accessorized with Maxi Gossamer’s latest offerings at FaMESHed. My lovely skin is Umazuma Metaluna’s newest piece, a lovely Asian skin with freckles sprinkled across the nose and a high ponytail from Circe Ishtari, drawn up with a scrunchie, completes my look.